The registry is one of the most vital components of the Microsoft Windows operating system. In simple phrase, it is a complex database containing virtually all system, software, hardware and user settings. Almost every piece of software keeps its data in the registry. It is so important that Windows would not even start without it. 2-Spyware.com parasite removal instructions often provide the lists of malicious registry entries that need to be deleted or modified. However, sometimes we all make mistakes. 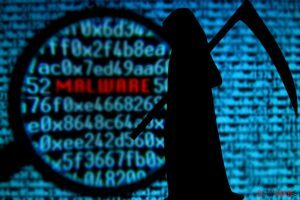 But one small mistake made while editing the Windows registry may not only disable some system functions, but also corrupt installed software or even damage the entire system. That is why you need to know how to backup and restore the registry. Just in case something goes wrong. The following guide thoroughly explains how to backup and restore the entire Windows registry. 2. Press the F8 key immediately when you see the Starting Windows 95 line at the top of the screen. 3. Select the option Safe Mode Command Prompt Only from the appeared startup menu. Press enter. This will back up the registry and split it into system.bkp and user.bkp files. You can find them in your main Windows directory. This will restore the registry from a backed up copy. If you did not back up your registry, you will be unable to restore it. 1. Click on the Start button and select the Run option. 2. Type in scanregw to the appeared field. Press the OK button. This will launch the Windows Registry Checker utility. 3. Wait until the registry scan finishes. You will be presented with a suggestion to back up the registry. Reply positively by clicking on the Yes button. 4. When the backup is over, press the OK button. 2a. For Windows 98, press and hold the CTRL key. This should bring the startup menu. Select the option Safe Mode Command Prompt Only and press enter. 2b. For Windows Millenium, boot your computer from a startup disk and wait until the startup menu will appear. Then select the option Start Computer without CD-ROM Support. Press enter. You will be presented with a list of the previous registry backups sorted by creation date. 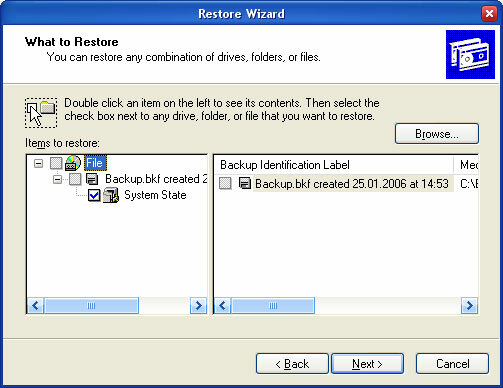 Select a backup, from which you would like to restore the Windows registry and press enter to restart your computer. 4. The system should restore the registry from a backed up copy. After the registry was successfully restored, press enter to restart your computer once again. 1. Click on the Start button and navigate to Programs (All Programs) > Accessories > System Tools. Then click on the Backup entry. This will launch the Backup Utility. 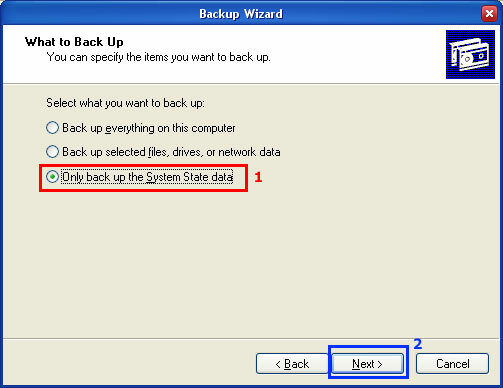 If there is no such entry, you will have to install the Backup Utility using your Windows installation disk. 2. Make sure the Backup Utility is in the wizard mode. 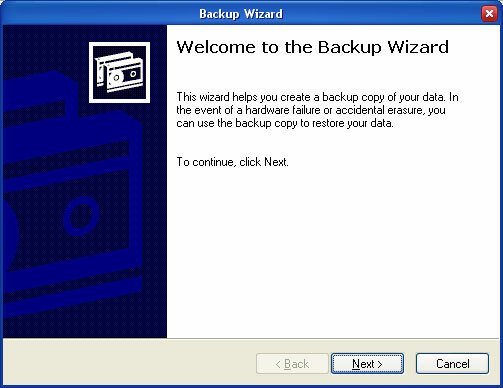 If it is not, click on the Backup Wizard (Advanced) (on Image 4 it is in the red box) button to launch the wizard. 3. Press the Next button in the wizard’s window. 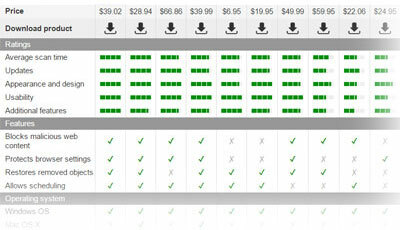 Select the option Only back up the System State data. Then press Next. Choose a place to save your backup, type a name for it and start the backup process by clicking on the Finish button. When the backup is completed, you will be presented with a report. 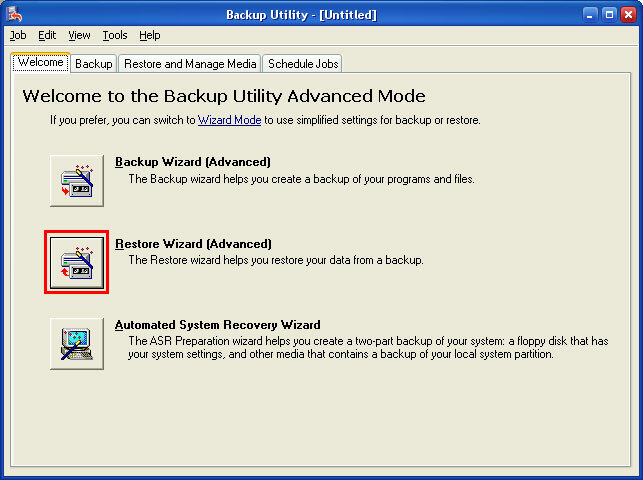 Now click Close to exit the Backup Utility. If it is not, click on the Restore Wizard (Advanced) (on Image 7 it is in the red box) button to launch the wizard. 3. Press the Next button in the wizard’s window. You will be presented with a list of all previous backups. Select the System State backup, from which you want to restore the registry. Then press Next. Start the restore process by clicking on the Finish button. When the restore is completed, you will be presented with a report. 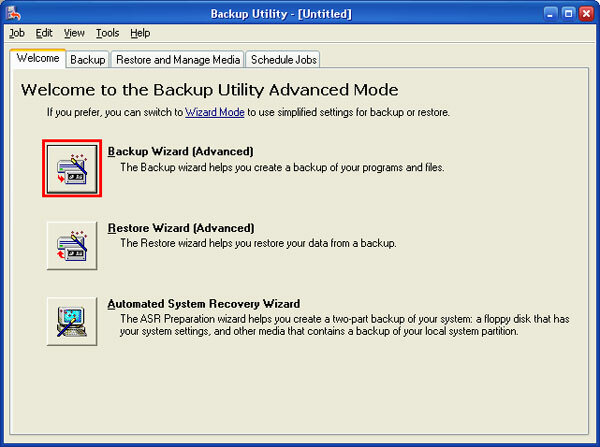 Now click Close to exit the Backup Utility. 1. Boot your computer from the Windows installation CD. 2. Press any key when you see the line Press Any Key to Boot from CD. 3. Now you should see the screen with three options: Setup, Repair, Quit. Press the R key to enter the repair mode. 4. Select the Windows installation, which registry you would like to restore. If you, like most other users, have only one installation, there will be only one entry in the list. 5. Then you will be asked to enter your administrator password. Type it in and press enter. If the system will ask you whether you want to overwrite the existing files or not, reply positively by pressing the Y key. 7. After you get finished, type the exit command and press enter. 8. Remove the Windows installation CD and restart your computer. Backing up and restoring the Windows registry can be difficult tasks for inexperienced users. However, these procedures are very important. Sometimes thi is the only way to restore the system corrupted by dangerous parasites or damaged by malfunctioning software. Be careful and patient while restoring the Windows registry. Do not try to restore your system without having a reliable backup! Without it you may even compound the felony. This entry was posted on 2006-01-25 at 05:18 and is filed under Articles, Security.